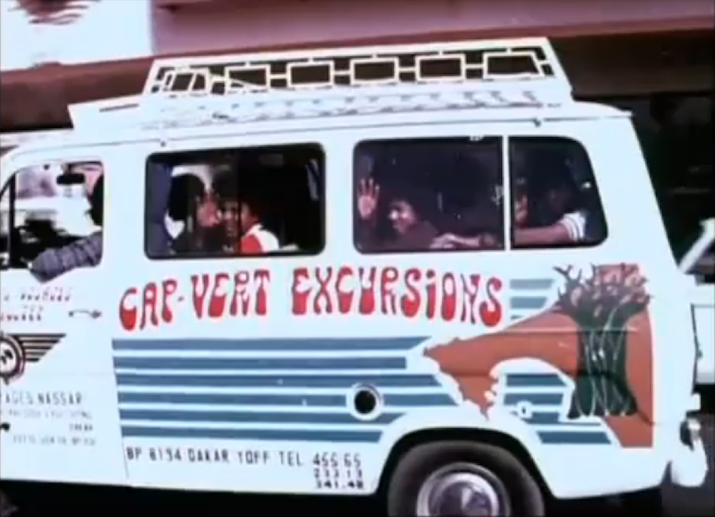 Michael Jackson was that rare public figure that you actually do want to see dance with the welcoming party — which he did in 1974 when he arrived in Senegal as part of the Jackson 5. 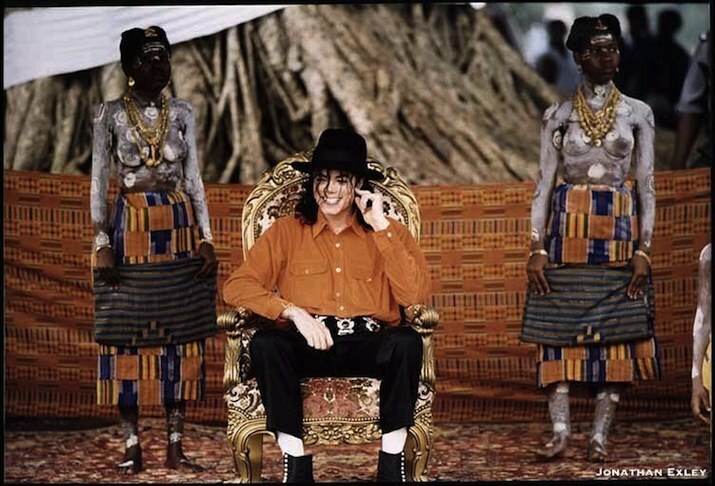 MJ's first trip to Africa was formative: he went on to spend time in Tunisia, Gabon, Cote d'Ivoire, Senegal, Tanzania, Egypt and South Africa, and in a May 1992 interview with Ebony Magazine, he described the continent as "home." During the interview he reflects warmly on his 1992 tour, despite controversy over whether he was or was not holding his nose when he disembarked the plane in Abidjan. 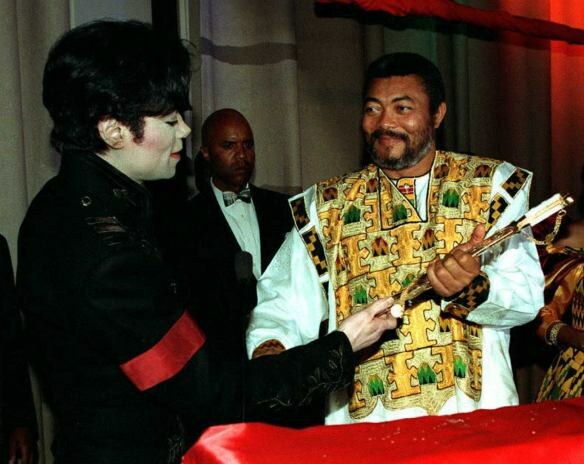 But like many African-Americans of his generation Jackson also reiterated some clichéd, romantic ideas about an Africa frozen in time: "for me, it's like the 'dawn of civilization'.... it is the root of all rhythm." To his credit MJ went on to mention his efforts to increase his understanding of the politics of the countries he visited. So, to celebrate the day humanity was graced with the birth of The King of Pop, we've compiled photographs and videos of Michael Jackson in Africa. The photos that follow are a mixed bag. Many are endearing and spectacular in their theatricality, but they are also marked by the tendency of Western photographers to seek out a "tribal" or "authentic" Africa. Consider the absence of urban Africa's cityscapes, or how often the camera finds Michael Jackson in his black and red uniform surrounded by Africans in ceremonial clothing that both construct and emphasize African exoticism and otherness. Here is also the familiar image of the the docile, adoring and parentless African child. Aside from the issue of representation, some images are troubling for other reasons, one in particular hints at the close ties between the Jackson family and Gabonese dictators Ali and Omar Bongo. 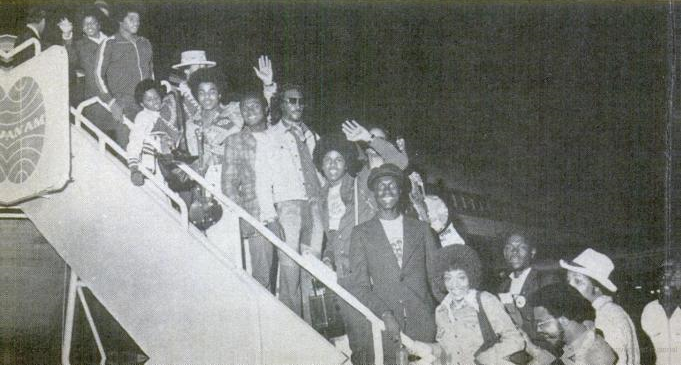 In 1974, Michael Jackson made his first trip to the continent as part of The Jackson 5. Originally an "African Tour" the Motown brothers were billed to play Ghana, Zambia and Ethiopia but the trip was cut short. Instead, they remained in Senegal, making trips out of Dakar to Joal (a fishing village) and Goree Island (departure point for Africans captured and sold into slavery). Here's footage of a 16 year old Michael Jackson performing to a 10,000 crowd. 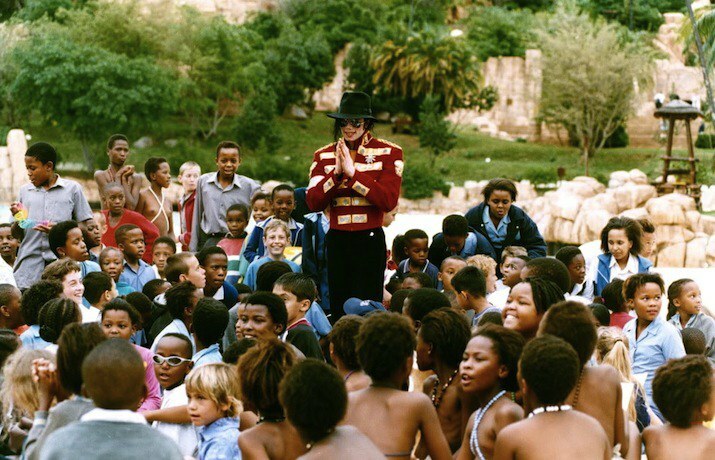 In the 1990s Michael Jackson made a series of high-profile visits to African countries as part of a non-performing tour which he took on the condition that he would be able to visit “orphanages, children’s hospitals, churches, schools and playgrounds.” Under the glare of the international press which concoted a variety of stories, he spent time in Gabon, Egypt, Tanzania and Cote d'Ivoire where he was crowned a king. 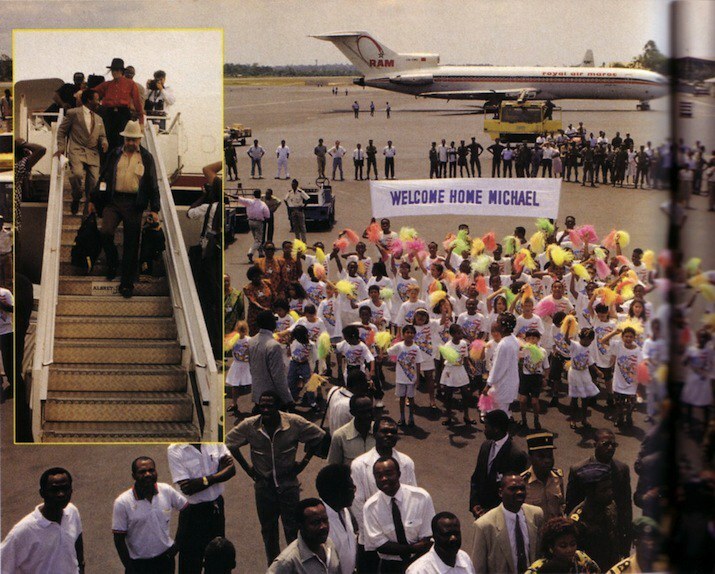 In Gabon he was welcomed by people holding signs that read "Welcome Home Michael," while in Cote d'Ivoire he was crowned a prince of the Anyi people. 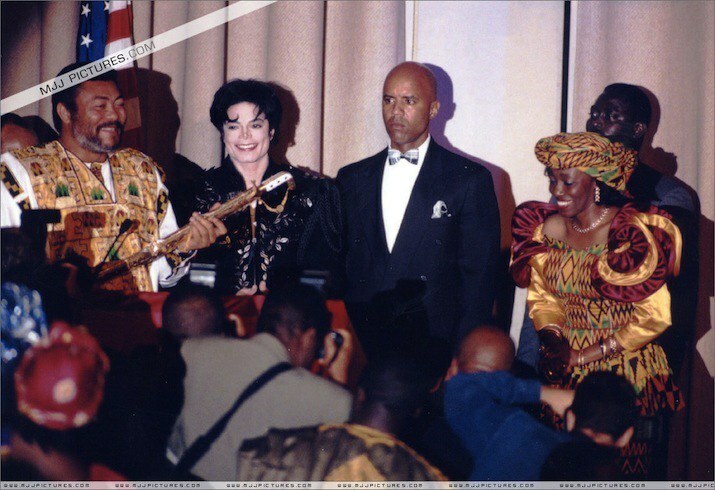 When he died, he also received a funeral in Cote d'Ivoire, Here he is being crowned back in '92. 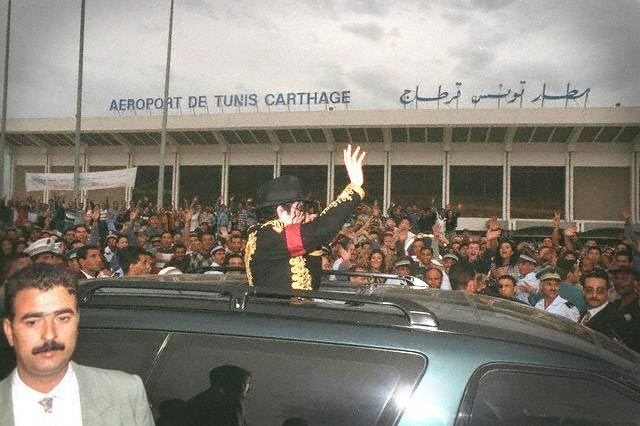 As part of his 1996/7 world tour, Jackson performed in Tunis, Tunisia and in Cape Town, Joburg and Durban, South Africa. The 9th single to be released form Jackson's seminal album, 'Liberian Girl' is a catchy track with a strange video. However, as one of the talking heads in Spike Lee's Bad25 notes, the song was a rare and welcome celebration of African women’s beauty. Geographically it's a little mixed up — the song which lauds the beauty of a woman from Liberia, West Africa, opens in Swahili with the South African singer and anti-apartheid campaigner Letta Mbulu who famously sang Not Yet Uhuru (1992) whispering: Naku Penda pia, Naku Taka pia, Mpenziwe! It's hard not to buss a smile at these pictures of two of the most adored public figures of the 1990s sharing a hug. 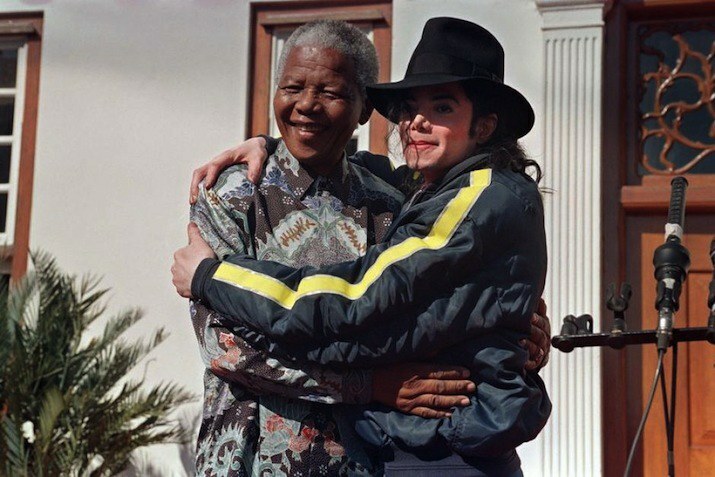 Michael Jackson and Nelson Mandela had a lot of love for each other. 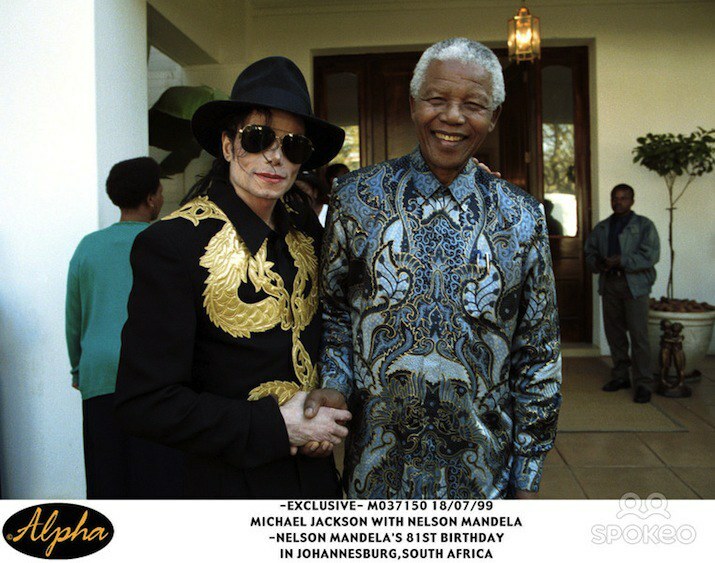 In prepared remarks that were read at Jackson's funeral, Mandela described him as a "a close member of our family" and saluted the fact that Jackson had been able to "triumph over tragedy on so many occasions in his life". 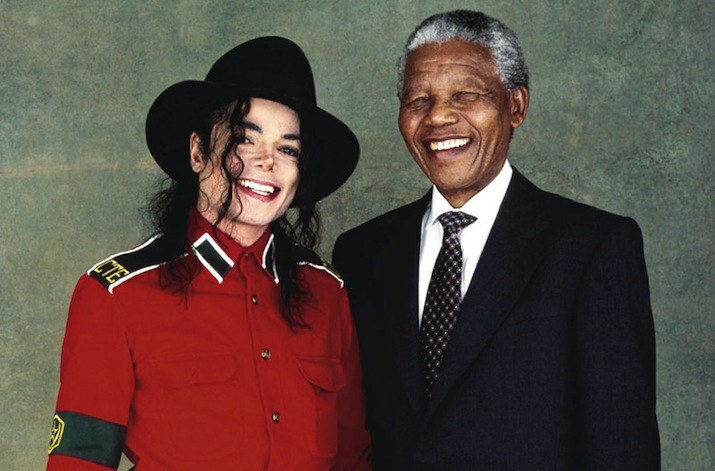 In 1999, standing beside South Africa's first black President, MJ said "I've had the time of my life here, I've had so much fun, I hate to leave. And I'm definitely looking for a home here, to buy, to spend the rest of my life here." 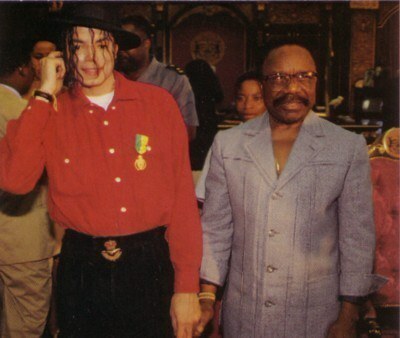 In February 1992, MJ traveled to Gabon at the invitation of one of Africa's longest-"serving" rulers Omar Bongo (pictured below). More than 100,000 people gathered to greet him, and he received the West African nations Medal of Honor from President Omar Bongo, who was the official host of the performer’s tour. President Bongo told Jackson that he was the first entertainer to ever receive the medal, which until then had only been given to heads of states and high-ranking dignitaries — including Nelson Mandela. President Bongo appointed his daughter, Pasoaline Bongo (also nation’s foreign Minister) and his son, Ali Bongo, to coordinate the tour along with Charles Bobbit, a consultant to the president, who initiated the idea for Jacksons visit. 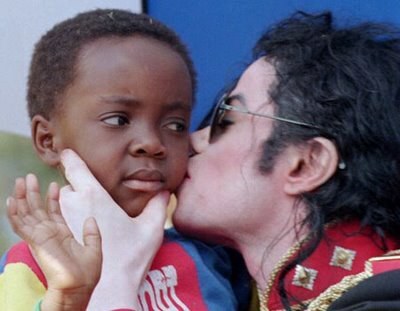 Read Omar Bongo's granddaughter's reflections on Michael Jackson's trip.